A mammogram is an X-ray picture of the breast that can detect a breast cancer or its early signs. At a time when guidelines seem to often change for when people should get a mammogram, it should not be overlooked as a vital step in every woman’s life. Aside from some types of skin cancer, breast cancer is the most common cancer in women — no matter your race or ethnicity, according to the Centers for Disease Control and Prevention. And getting a mammogram can help women spot and treat the cancer, said Dr. Ami A. Chitalia, a breast medical oncologist at MedStar Washington Hospital Center. “If an abnormality is caught, it can be treated and followed promptly,” Dr. Chitalia said. The American Cancer Society’s 2018 mammography guidelines suggest that women at average risk for breast cancer have yearly mammograms starting at age 45, then switch to every other year at age 55. Also, the ACS adds that women should have a choice to start screening as early as age 40, and that screening should continue as long as women are in good health and are expected to live at least another 10 years. Still, the decision about when to get a mammogram starts with a conversation between the patient and a primary care doctor, Dr. Chitalia said. “Above all, I think it’s important to use shared decision making, with a physician helping the patient to weigh pros and cons to come to an informed, value-based individualized decision,” she said, adding that a family history of breast or ovarian cancer may call for a patient to undergo screening at an earlier age than an average woman. Women should schedule their mammograms for when their breasts are the least tender, which tends to be the week after their menstrual cycle, Dr. Chitalia said. Also, patients who have had mammograms at outside facilities in the past should bring in their images and reports so radiologists can see them. Before undergoing a mammogram, patients should let the technician know if they have had previous biopsies or implants, Dr. Chitalia said. She adds that patients should skip lotions, perfumes and deodorant that day. During the 20-30-minute procedure, the woman will remove all clothing and jewelry from the waist up, stand and place one breast at a time on the machine’s plate. The machine will compress the breast in order to take a picture, Dr. Chitalia said. “The reason that’s done is because it’s important for breast tissue to be spread out as much as possible so that the X-ray can go through all of the tissue and the most complete and detailed set of pictures can be taken,” she said. Most women describe a mammogram as just uncomfortable, however some women find the process somewhat painful. There are some remedies for women who may be jittery about the procedure. “A lot of women have some anxiety related to their mammogram; they’re worried about discomfort or pain. So I always tell patients it is OK to take a mild pain medication such as Tylenol or an ibuprofen product as long as it’s approved by their physician about an hour before their mammogram to alleviate some of that discomfort if they’ve experienced that before,” Dr. Chitalia said. 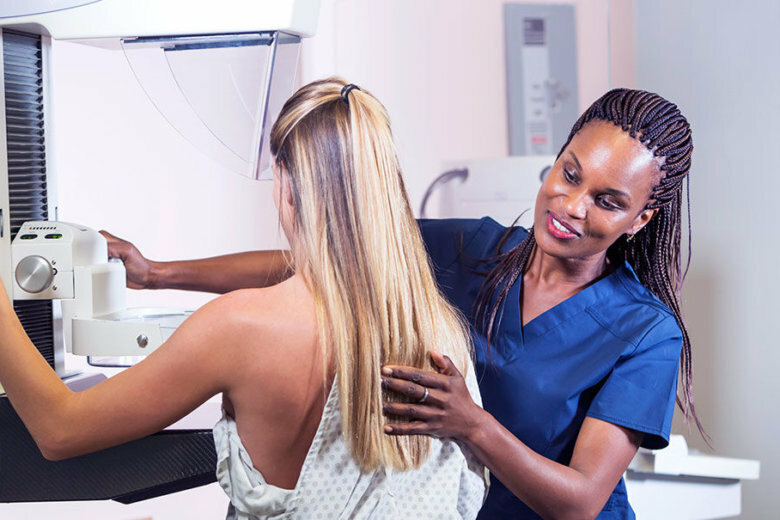 There are two types of mammograms, which can be used either for screening or diagnostic purposes. The type of screening can yield results at different timelines, Dr. Chitalia said. Results can take up to one week with screening mammograms, whereas results are reported the same day with diagnostic mammograms. If a mammogram detects an abnormality, it can be handled many different ways. Ultimately, “it really depends on the abnormality that is found, the score given by the radiologist and then the recommendation given following that,” Dr. Chitalia said. Patients seeking quality care will be in good hands at MedStar Washington Hospital Center, Dr. Chitalia assured. “We offer comprehensive care so if there is an abnormality, patients can see a large multidisciplinary team including nurses, radiologists, surgeons, radiation doctors and medical oncologists such as myself all in the same building, which is nice for them,” she said. For more insights from Dr. Chitalia, including her podcast on mammograms, click here.